Members of the Maine House of Representatives sign their oaths during the first session of the 128th Legislature at the State House in Augusta, Feb. 7, 2016. 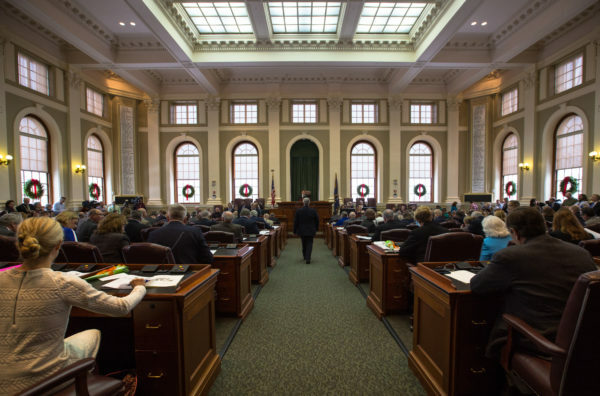 A bill compelling Maine cities to act as extensions of federal immigration authorities has been rejected by the House of Representatives. The Democratic controlled House voted 77-59 against the bill in a preliminary vote. The proposal is known as an anti-sanctuary city bill. There are at least 30 such bills in state houses across the country. Republican Rep. Lance Harvell was among those who voted against the proposal. “I fear that the chilling effect of this bill would be that those that aren’t wanted might not come. That’s human capital. And in a state that’s aging, that’s very problematic,” he said. Rep. Larry Lockman, R-Amherst, said the proposal will help local police departments prevent violent crime. “Our local police officers in Maine are the last line of defense against violent criminals,” he said. Under Lockman’s bill, the local communities that don’t cooperate — the sanctuary cities — would risk losing state funds. Lockman said the bill will facilitate the removal of potential criminals or terrorists. Lockman is a controversial figure in Augusta, and his bill comes at a time of increased nationalism and economic and racial anxiety over immigration in America. President Donald Trump deployed soaring rhetoric about immigrants during his successful campaign to the White House. And one of his first acts as president was to sign an executive order that withholds funds from cities that don’t fully cooperate with federal immigration authorities. Lockman’s bill and other like it are essentially state versions of Trump’s order. The proposals have been fought by the ACLU and immigrant advocates. The proposal faces additional votes in the Senate and House, but Wednesday’s vote appears to signal its defeat.